The iPhone has been around for a decade now, but Apple's iOS remains fertile ground for a wide variety of great mobile games across every genre. Armed with strong graphics and responsive touch screens, the iPhone and iPad are solid gaming machines. So it's no surprise that developers continue to produce top-notch games for Apple's mobile devices. Whether you've just gotten a new iPhone 8 and want to load it up with games or you're a long-time iOS owner who wants to try something new, we've found a great game for you. What is Sling Ball Adventure? We’re talking about an awesome iOS game called Sling Ball Adventure. 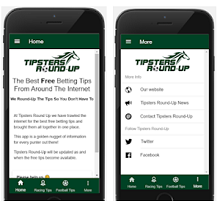 There are many reasons why we recommend it to our readers, but mainly because it offers an addictive gameplay and intuitive design. Basically, this game app is an endless tap swipe balls game, which is suitable for all ages. 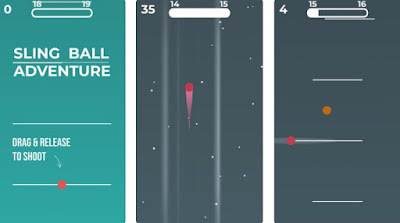 Sling Ball Adventure will definitely challenge your tap skills, your reflexes and reactions. 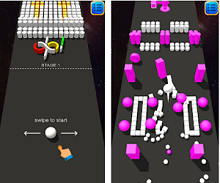 Your main goal in this gameplay is to sling the balls as fast as you can and try to avoid the obstacles on your way to get as far as possible. Simple as that! But don’t fool yourself – as you play you will find out how addictive this game is. All you need to do on the endless swipe game is to sling the balls as fast as you can to get far and win high scores for your achievements. Swipe with your finger on the screen to sling the balls as long and fast as you can to win high scores and become the master of the game. Also, you will need to be careful in order not to hit the red obstacles on your way up. Red dots and red squares are making your way up even more challenging, so you have to sling the balls fast without touching any obstacles, or else you’ll lose. Test your reaction skills and get far to win scores, download this extremely addictive and fun game for free from the App Store.